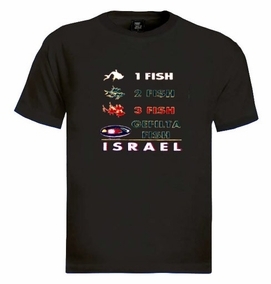 Hilarious shirt, with Jewish humor. Based on the Dr. Seuss story, a funny print on front of this shirt "One Fish, Two Fish, Gefilte fish". Also printed underneath it "ISRAEL" in English. Printed in wonderful colors which mix well together. Our t-shirts are made of 100% cotton and are long lasting with bright colors. Our products are all designed and printed in Israel.